When you have old gold jewelry which you are not going to wear further, sell it for good amount. Now the all story lies between sale and good amount. The questions arises in mind where to sell gold and how to get best price for old jewelry. So Cash for gold is here to serve you best answer for these questions. Do you know, you can get ultimate returns on selling your unwanted ornaments? Ultimate return means you can get more than the market value of the asset. Yes, you have read correctly, we are here offering 115% value of current market value of asset. Therefore, go and search all your undesired precious items for sell, you can generate amazing amount of money from it. We accept each and every item which is made up of gold, silver, platinum and diamond. So when you have some pieces of this metal, collect them and bring it to us. We will offer you good amount of cash for it. The ultimate fact is you will get instant cash i.e. at immediate point of time. Our process largely takes few minutes and you will be paid. Our large client base trust on us as reliable source for getting immediate liquidity at time. Therefore, in situations of extreme emergencies, we are here stand up with you to fulfil your need. You do not need to worry about the large amount of funds. If you have precious jewelry or other item to sale, we have cash to offer. Not only cash, we have multiple payment options available for your comfort. You can reach out to us online and deal with us with the help of our digital mode transaction. Moreover, we have also physical presence where you can come and proceed with us further. We are one of the most reliable place to sell precious jewelry at best price. Therefore, reach out to us to know more about us. Like reading our blogs? 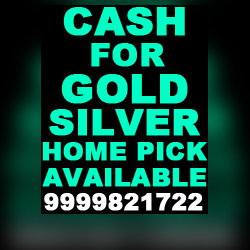 Then visit us at cashforgolddelhincr.com for more of the same guides to help you during a good sale and help you earn the best price you are looking for.